Early May planting is yet another reason I love living in Vancouver. Of course, this year we haven't really seen much sun so I might have been a little preemptive, but I just couldn't wait any longer! This past weekend the ladies and I got together and harvested the winter crop from the plot, then threw in seedlings and seeds for the first round of summer planting. We had a nice (albeit small) cabbage and tons of gorgeous kale to donate to the food bank. The first round of summer planting consisted of my zucchini, squash, and cuke seedlings (fingers crossed that they make it! ), some marigolds and nasturtium seedlings to attract the good bugs and deter the bad, and radishes, beets, arugula, and swiss chard from seed. I think that's everything! We are still waiting on the garlic to be ready to harvest, and we have left the broccoli sprouts and kale in the ground to flower so that we can save some seeds for next year. After that I planted my personal plot. Peas, sweet peas, beans (all pre-soaked overnight to encourage faster germination), radishes, carrots, romaine lettuce, and swiss chard seeds all made it into my space. 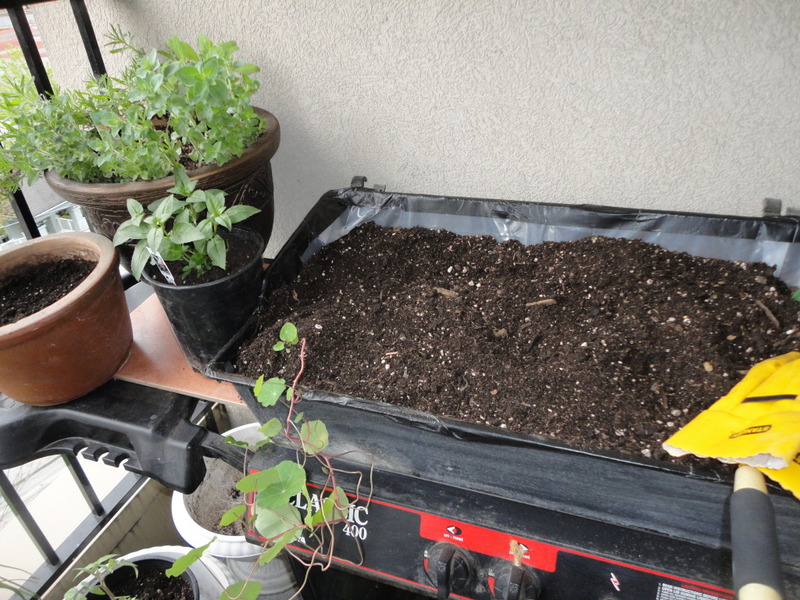 I also put in squash, zucchini, and cucumber seedlings, as well as nasturtium and marigolds. I still have tulips, garlic, and brocolli in my bed that over wintered (not to mention strawberries and pansies) so it's going to be a very full plot this year! Pictures to come, I forgot my camera on Sunday. After I got home it was time to tackle the balcony. My amazing husband finally took apart the BBQ and lined it with poly so I could throw in some dirt and turn it into a planter. I have put a nasturtium and some sweet pea seeds in, but will wait until after the plant sale this weekend to plant the rest. I also planted another round of seedlings (mostly herbs and flowers) and I'm hoping to add them to the balcony garden by early July. 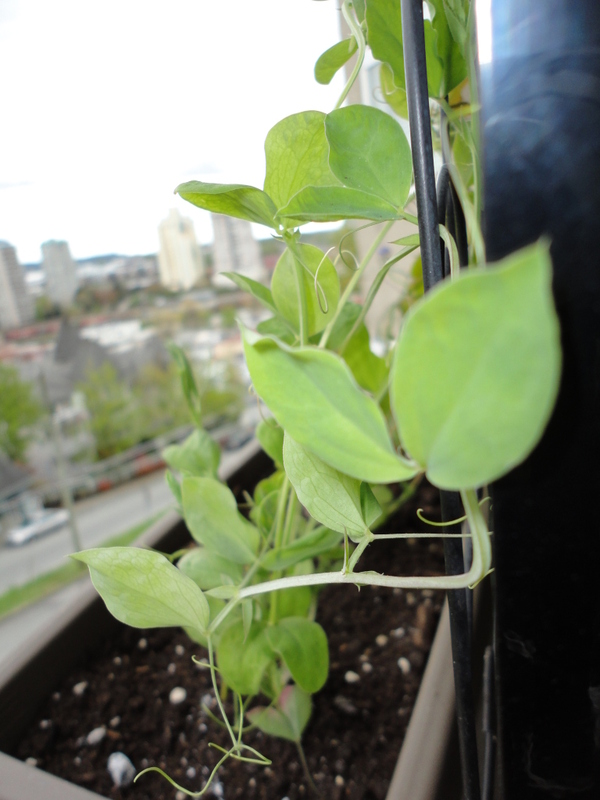 In the meantime, I have some sweet peas climbing on the railing and some night scented stalk peeking out of the dirt. This year I've completely changed the way I've done my balcony garden, so I'm excited to see how it turns out! Speaking of which, more about balcony gardens next entry - how to deal with common problems and steps you can take to keep your plants healthy and out of harms way.